[S6] G.E. Cokayne; with Vicary Gibbs, H.A. Doubleday, Geoffrey H. White, Duncan Warrand and Lord Howard de Walden, editors, The Complete Peerage of England, Scotland, Ireland, Great Britain and the United Kingdom, Extant, Extinct or Dormant, new ed., 13 volumes in 14 (1910-1959; reprint in 6 volumes, Gloucester, U.K.: Alan Sutton Publishing, 2000), volume I, page 116. Hereinafter cited as The Complete Peerage. He lived at New Bounds, Tonbridge, Kent, EnglandG.1 He gained the title of 4th Baronet l'Anson. 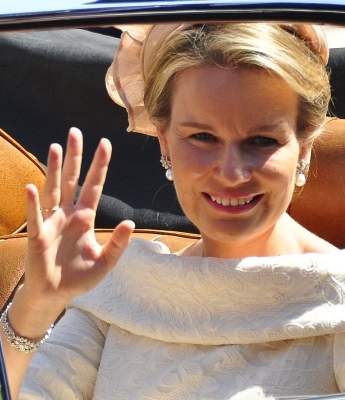 Mathilde d'Udekem d'Acoz was born on 20 January 1973 at Uccle, BelgiumG.3 She is the daughter of Comte Patrick Paul François Marie Ghislain d'Udekem d'Acoz and Countess Anna Maria Komorowska.1 She married Philippe Léopold Louis Marie de Belgique, Prince de Belgique, son of Albert II, Roi des Belges and Donna Paola Ruffo di Calabria, dei Principi Ruffo des Calabria, on 4 December 1999. [S6] G.E. Cokayne; with Vicary Gibbs, H.A. Doubleday, Geoffrey H. White, Duncan Warrand and Lord Howard de Walden, editors, The Complete Peerage of England, Scotland, Ireland, Great Britain and the United Kingdom, Extant, Extinct or Dormant, new ed., 13 volumes in 14 (1910-1959; reprint in 6 volumes, Gloucester, U.K.: Alan Sutton Publishing, 2000), volume I, page 355. Hereinafter cited as The Complete Peerage. Rudolph-Karl Baron von Stengal was born on 7 December 1899. He married Marie Valerie Gräfin von Seefried auf Buttenheim, daughter of Otto Graf von Seefried auf Buttenheim and Elisabeth Marie Prinzessin von Bayern, on 24 June 1923. He and Marie Valerie Gräfin von Seefried auf Buttenheim were divorced in 1931. He married Marie Luise Prinzessin zu Schleswig-Holstein-Sonderburg-Glücksburg, daughter of Albrecht Prinz zu Schleswig-Holstein-Sonderburg-Glücksburg and Ortrud Gräfin zu Ysenburg und Büdingen, on 19 April 1934 at PrimkenauG. He and Marie Luise Prinzessin zu Schleswig-Holstein-Sonderburg-Glücksburg were divorced on 10 August 1955. He died on 21 September 1969 at age 69 at Rieden, GermanyG. Friedrich Christian Prinz zu Schaumburg-Lippe was born on 5 June 1906. He was the son of Stephan Albecht Georg Prinz zu Schaumburg-Lippe and Marie Anne Prinzessin von Sachsen-Altenburg. He married, firstly, Alexandra Hedwig Johanna Bertha Marie Gräfin zu Castell-Rüdenhausen, daughter of Wolfgang Friedrich Heinrich Philipp Graf zu Castell-Rüdenhausen and Hedwig Baronin von Faber, on 25 September 1927 at SeelasgenG. He married, secondly, Marie Luise Prinzessin zu Schleswig-Holstein-Sonderburg-Glücksburg, daughter of Albrecht Prinz zu Schleswig-Holstein-Sonderburg-Glücksburg and Ortrud Gräfin zu Ysenburg und Büdingen, on 15 October 1962. He married, thirdly, Helene Mayr on 6 March 1971 at SchlangenbadG. He died on 20 September 1983 at age 77 at Wasserburg, GermanyG. He gained the rank of Ensign before 1715 in the British Army.3 He was as a matter of historical fact is deemed to have succeeded his elder brother as 5th Baron Altham and as which took seat in Irish House Lords on 28 Nov 1727 on 16 November 1727.2 He succeeded as the 5th Baron Altham, of Altham, co. Cork [I., 1681] on 16 November 1727.1 He succeeded as the 7th Viscount of Valentia, co. Kerry [I., 1622] on 1 April 1737.1 He succeeded as the 6th Earl of Anglesey, in Wales [E., 1661] on 1 April 1737.3 On 1 April 1737 as a matter of historical fact he is deemed to have succeeded his cousin as 6th Earl of Angelsey.2 He succeeded as the 7th Baron Mountnorris, of Mountnorris, co. Armagh [I., 1629] on 1 April 1737.2 He succeeded as the 7th Baronet Annesley, of Mountnorris, co. Armagh [I., 1620] on 1 April 1737.2 He succeeded as the 6th Baron Annesley, of Newport Pagnel, Buckinghamshire [E., 1661] on 1 April 1737.3 On 3 August 1744 he was convicted of assaulting Hon. James Annesley, the claimant to his estates. He was found guilty of selling James into slavery and claiming he was dead, thereby claiming James' estates and titles.3 He held the office of Governor of County Wexford before 1745.3 He lived in 1745 at Camolin Park, County Wexford, IrelandG.3 His last will was dated 7 April 1759. [S6] Cokayne, and others, The Complete Peerage, volume I, page 136. [S18] Matthew H.C.G., editor, Dictionary of National Biography on CD-ROM (Oxford, U.K.: Oxford University Press, 1995), reference "Annesley, Richard, 1694-1761". Hereinafter cited as Dictionary of National Biography. Alexander Karl Herzog von Anhalt-Bernburg was born on 2 March 1805 at Ballenstedt, GermanyG. He was the son of Alexis Friedrich Christian Herzog von Anhalt-Bernburg and Marie Friederike Prinzessin von Hessen-Kassel. He married Friederike Caroline Prinzessin zu Schleswig-Holstein-Sonderburg-Glücksburg, daughter of Frederik Wilhelm Paul Leopold Herzog zu Schleswig-Holstein-Sonderburg-Glücksburg and Luise Karoline Prinzessin von Hessen-Kassel, on 30 October 1834 at Schloss Louisenlund, Schleswig, Schleswig-Holstein, GermanyG. He died on 19 August 1863 at age 58. He gained the title of Herzog von Anhalt-Bernburg. He gained the title of Prinz von Anhalt-Bernburg.